One is always certain of finding a large crowd standing before Gérôme 's Duel. It is the popular success of the Salon; and, as the picture is not large, one has to wait for his turn to see it. This popularity, I hasten to remark, is not due to any method that is foreign to art. Nourished by the severest studies and naturally endowed with an exceptionally pure taste, the young master would scorn a triumph gained at such a price. The strangeness of the subject attracts the public and the merit of the execution holds the connoisseur. It would be almost trite to say that the forms and costumes of modern life are not attractive to the painter. Artists are so convinced of this fact, that they prefer to borrow the subjects of their compositions. It is only in the last extremity, in the portrait for instance, that they resign themselves to the fashions of the day, and even then they; alter them as much as possible by the introduction of mantles, burnous shawls, scarfs and other accessories having some special character. Even in genre pictures they stop at the last century with the picturesque material of the Pyrenees, Brittany, Aragon and Algeria. The number of canvases that might be used in future ages as documents for our interiors, furniture, costumes, types and modes of living, is extremely limited; and, unfortunately, almost always of mediocre execution. It would seem that the art of to-day is affected by farsightedness, and can only discern objects belonging to remote and bygone ages: it sees nothing in what is taking place. Aside from portraits and some official pictures few canvases depict the present period. We must, therefore, thank M. Gérôme, the painter of Grecian elegance, the Pompeian archaeologist, the expert in exotic and primitive types, for having selected a subject from our modern life: he risks much in handling a scene of which every one is, or thinks he is, capable of judging, and in adapting new matter, new physiognomies and new attire to the exigencies of art. What would have been the result if he had painted a duel fought in black coats ? The idea of the Duel after the Masquerade is ingenious, thrilling, romantic; it impresses both eye and mind by the antithesis of the action and the actors—terrible action and grotesque actors, a duel of Pierrots and Harlequins elevated to a tragic height, without avoiding a single comic detail. Some young men, probably overheated with wine, have quarrelled on the steps of the Opera, or in some cabinet in the Maison d'Or, on account of a push with an elbow, a too-cutting sarcasm, a slight fit of jealousy, or for any other trifling reason. One of those busy bodies, who are always ready to display courage with the blood of other people, has procured swords, and without taking time to change their costumes the merrymakers have gone in two carriages to the Bois de Boulogne, where the grey dawn is just beginning to open its heavy eyes upon the morning mist through which skeletons of slender trees are dimly seen. The snow has covered the earth with a white winding-sheet that has been spread out during the night as if to receive the dead. Cold and silence and solitude have kept watch so that nothing should disturb the duellists; and, indeed, they have succeeded only too well in this unfortunate affair. Foot-prints in the snow show the place of the struggle: one of the duellists— Pierrot—has been wounded and could repeat Mercutio's funereal pun: " Ask me to-morrow and you shall find me a grave man! " The red stains of blood are spreading over the cassock with the big buttons, the legs, which life is leaving and over which the will has no longer any control, lie inert upon the snow, and even in the loose trousers seem already in a shroud. Were it not for the support of a friend, dressed as a valet of the Comedie-Frangaise, he would lie prostrate. The pallor of death appears through the paint that has been partly wiped from the face of poor Pierrot; his dull eye already stares into vacancy and on the drawn lips his expiring sigh leaves a rosy foam. The sleeve of the right arm, turned up above the elbow for the combat, exposes the quivering flesh and weak muscles of the young debauchee, who still holds in his contracted fingers the sword that has so badly defended its master. Another person, dressed in the costume of a Chinese mandarin, in red and green, covered with flowers of fantastic design, has dropped upon his knees and is examining with terrible anxiety the blood-stained breast of his victim. A little in the rear of this group a man in a black domino is lifting his hands with a gesture of despair, as if about to tear his hair at the deplorable result of this silly quarrel. Mohican. 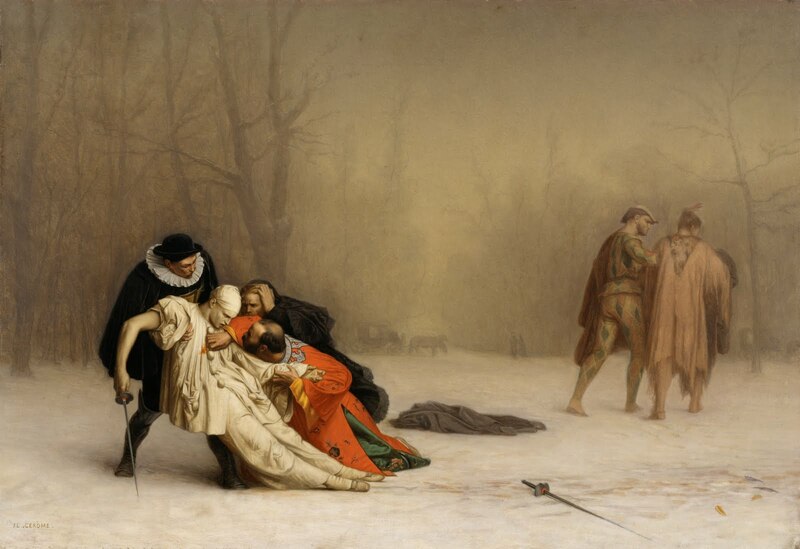 Harlequin, in preparing for the fight, has thrown on the snow his black mask and his cloak; his bloodstained sword lies on the ground and these significant accessories skilfully connect the two parts of the composition; the Harlequin seems to be excitedly telling the Indian, whose arm he is grasping, that his opponent did not parry, that he ran himself upon the sword and other explanations; and his companion bends his head as if to ask " What can we do about it ?" In the background the black silhouette of the carriage of the wounded man assumes in the fog the melancholy look of a hearse, and the drivers, who are whispering together, seem like undertakers. Surely this is odd and sinister, a strange mixture of wild and romantic fancy with philosophical daring. To mix up the Carnival and Death, to change the wooden sword of Harlequin into a real sword; to transform the spots of wine into bloodstains, to surround the death agony with a circle of masks and to ask of Harlequin—"what hast thou done with thy brother Pierrot? "—all this would make the most intrepid pause. M. Gérôme has performed this difficult, not to say impossible, task with an icy severity, a pitiless sangfroid, an irony superior to fate. He has omitted nothing: there is the crimson hole that a drop of warm blood has melted in the snow; there are the spangles glittering on the lozenges of the murderer's coat; there is the bear's claw on the collar of the Indian; there is the formless and battered mask; and the cold death sweat that dissolves the paint on the face of the dying man. All this is rendered with a clean, firm, delicate and sure touch which keeps everything perfectly united, and a tone that is sober, neutral and wintry, so to speak, created by the livid shuddering pallor of the chief figure in the midst of which the brilliant vivid hues of the costumes produce a sinister discord. The face of Pierrot, who is sobered by the approach of Death and who is passing from the dizzy whirl of a masked ball to the silence of the tomb, is a creation of powerful orginality. No grimace, no melodrama, no straining after effect. There is something here as striking and strong as a page of Merimeé. The impression produced is all the more profound because the narrator appears indifferent. M. Gérôme, like a careful artist, does not leave his frames to the fancy of the gilder. He has designed the one for this picture: on the top are two masks—tragic and comic— separated by a fool's bauble. Does not Folly dance between Joy and Sorrow, causing one to be born of the other ?